Senegal, 2013 , 86 min. Sophie, Abdoulaye and Thierno’s three destinies cross paths and echo one another, delineating a constellation of exile. Sophie journeys from Dakar, Senegal, to join her husband Abdoulaye in Turin, Italy. 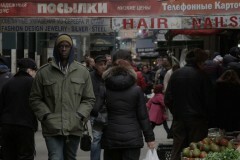 Meanwhile, Abdoulaye has left for a new job opportunity in New York, hoping to stay with Sophie’s aunt. However, Sophie’s aunt and 19-year-old son Thierno are in Dakar for Thierno’s father’s funeral. With these three characters’ destinies, Under the Starry Sky takes us on a journey through the diversity of the cities the characters travel to, confronting us with the realities, hopes, and dreams of contemporary emigration. In French, Wolof and English with English subtitles.